Is the day of Purim to be celebrated as a holiday in its own right, or is it just the occasion for fulfilling or performing specific commandments, (namely the reading of the Book of Esther, having a festive meal during the day, interchanging gifts of food with friends, and giving special assistance to the poor)? Logically, if Purim is only the occasion for fulfilling specific commandments, then it would lose all meaning and be like any other day for Jews who do not fulfill these commandments. Finally, what would make Purim a holiday is if it were a Yom Tov, i.e. a day on which work is forbidden. When we look in the Book of Esther, it appears at first glance that Purim was established as a Yom Tov. The Jews agreed to observe the fourteenth (or fifteenth day) of Adar because on these days the Jews rested from battling their respective enemies. The text clearly states, “And it was the month that was turned for them from agony to happiness and from mourning to a Yom Tov.” Esther 9:22. 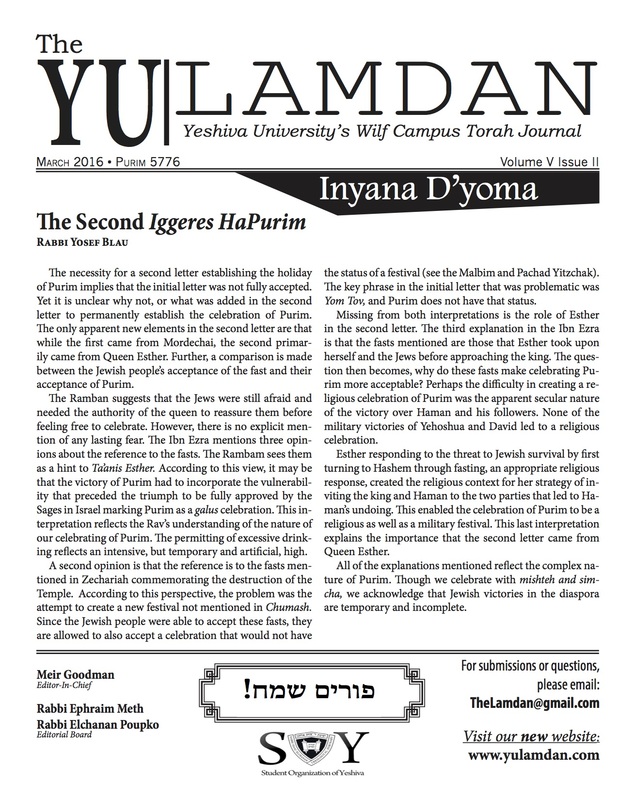 This (that Purim should be a Yom Tov) indeed was one opinion that was stated in the Talmud. Megilla 5b. One could say that the Jews accepted these days to forbid eulogies and fasting [as all the other minor holidays listed in Megillat Taanit], but they never accepted the principle of not doing any work on Purim. Although the beginning of the text states that these are days of happiness, drinking, and are considered a Yom Tov, the end of the text states, “to make them days of drinking and happiness” but does not state that they were made into a Yom Tov. Thus, the Jews of the time deliberately decided not to consider Purim a Yom Tov and work is permitted on that day. Megilla 5a. Thus, although Purim was not made into a Yom Tov, we must still ask whether there is any significance to the day itself or just to the four mitzvoth associated with it. The Talmud tells us (see first Mishnah of Megilla) that Jews who live in small villages (and thus have no one to read the Megilla for them) may have the Megilla read for them earlier than the fourteenth of Adar on the days that they would normally come to the city for market purposes (i.e. Mondays or Thursdays). They do not have to make an additional trip to the city just to hear the Megilla. On the non-Purim days when the villagers come to hear the Megilla, they are also obligated to give charity to the poor, because the poor always connected the reading of the Megilla with receiving charity and would be disappointed if no charity was given to them on these occasions. Nevertheless, the fulfillment of the other mitzvot, i.e. a festive meal and exchange of gifts of food should only be accomplished on the fourteenth of Adar itself. See Rambam, Mishneh Torah, Megilla 2:14. Nevertheless, a logical difficulty does exist with the law that requires the celebration only on the day of Purim itself. If the day is not significant for itself, but is only a framework for fulfilling the commandments, why should we distinguish between the fulfillment of these mitzvot and insist that drinking and celebration must only occur on the Fourteenth of Adar? We must therefore conclude that there must be significance to the day of Purim itself, even though it is not a Yom Tov and work is permitted. What then is the significance of this day? The Rambam offers an interesting interpretation. What is significant about the manner in which the Rambam states this law, is that he makes no reference to the mitzvot of Purim, but rather to the days of Purim that will never be forgotten. This clearly implies that there is something unique about the days themselves. What then is special about these days? The significance of these days is that these are the very days on which we were supposed to be destroyed. The purpose of Purim is not just to remember that we could have been annihilated, but to actually celebrate God’s salvation at the exact moment when the destruction was supposed to take place. To celebrate on another day simply would not have the same significance. In truth, all the mitzvoth associated with Purim assume an awareness of the avoidance of catastrophe. The laughter and celebration of Purim is one of relief. The possible annihilation of our entire nation is a memory always tucked away in the back of our minds. It is no accident that this memory is highlighted by Shabbat Zachor which always occurs on the Shabbat preceding Purim and on Purim morning we read about the attack by Amalek. Thus, although villagers are permitted to hear the Megillah on a non-Purim day for the practical reason that there is no one to read it for them on the day itself (and by extension were required to give gifts to the poor), the celebration itself (i.e. festive meal, exchanging gifts of food, no eulogies or mourning) must take place on the actual day of Purim. (In many ways this celebration is similar to Tisha B’Av in which Jews not only have to remember the destruction of the Temples, but actually have to mourn on that day by fasting, not wearing leather shoes etc.) It is for this reason that Purim will not be nullified in the days of the Messiah. It is a celebration of God’s salvation.